The results of AP ICET 2018 will be declared by Sri Venkateswara University, Tirupati in the second week of May. More than 70000 of people appear in the AP ICET 2018. APICET results will be available online and candidates have to enter their registration number and date of birth to the check the same. AP ICET 2018 results will be announced for all candidates appearing for the exam. The minimum qualifying marks for reserved category is 25% while there is no qualifying score for SC and ST candidates. The scores of AP ICET 2018 will be valid for a year only. Candidates can read below for more details on AP ICET 2018 normalization procedure, rank list, scorecard and cut-off. 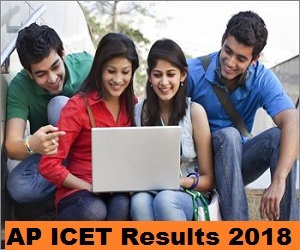 How to check AP ICET Results 2018? Visit the official website i.e. sche.ap.gov.in. For the preparation of merit list, the following policy is adapted to break the ties if more than one student secures the same marks. If the tie still persists, the tie will be resolved by taking into account age of the candidate, older ones will be given priority. What after declaration of AP ICET Results 2018 ? Candidates qualifying AP ICET 2018 will be called to participate in counselling. AP ICET counselling is conducted to allot seats to candidates in the colleges and universities of Andhra Pradesh. Based on ranks in merit list, candidates will be called for counselling. The stages of counselling are given below. Registration for verification of certificates. Access and fill in the online option form with the help of the manual form. Payment of the fee, reporting at the college and participating in the pre-admission processes. AP ICET cutoff is the minimum qualifying marks to be scored by candidates to be eligible for counselling rounds. The cutoff will be released after the declaration of result. AP ICET cutoff will be available in the form of opening and closing rank. AP ICET cutoff will depend on total number of candidates, availability of seats and difficulty level of the exam. Andhra Pradesh Integrated Common Entrance Test or AP ICET is conducted for admission into the Master of Business Administration (MBA) in university and colleges in Andhra Pradesh. The test aims to assess a candidate’s ability to think systematically, verbal and mathematical skills.